I’m not actually dead yet, but there’s lotsa stuff wrong with me besides simple old age, and even though the odds are very, very low that i’ll drop dead tomorrow, i figured i’d go ahead and post my obituary so i don’t have to risk someone else screwing it up. Besides, we see all too few obits nowadays written in the first person. Think of this as a pre-need obit like my pre-need arrangement with the Neptune Society. Matte Gray 1941-2019 aged 78 and astonished that i lived so long. I’ll start with a blanket apology to all those i’ve wronged. Has to be blanket because otherwise this part would run to too many pages. Well, at least if it listed all the individual wrongs that i review instead of sleeping. Isabella Allende remarked on the death of Roberto Bolaño, “Dying does not make you a nicer person.” True enough, but at least it prevents you from committing more wrongs. or in the worst case scenario, something boring like a runaway illness. Others conquered countries, wrote acclaimed novels, won international prizes, made millions of dollars, had illustrious careers, and were survived by a dozen loving grandchildren. Me, i was just a B+ kind of guy whose only achievement was this website, so i hope you got some entertainment out of it because i sure enjoyed writing it. Subsisted on crumbs? Sure, but i brought some pleasure to a good many people, stayed out of jail, outlived my enemies, and was survived by a dwindling handful of loyal friends and my beloved sister, who gets any leftover money. Oh, and i can’t go much into this lest it be “coat tailing”, but in the last year i developed even more medical problems. And my legs continued to get weaker and weaker, leaving me more and more dependent on the Segway and, since my upper body strength has dwindled, reduced to using folding aluminum ramps to get it into the back of the Prius. I’m hoping that it’ll be my abdominal aortal aneurysm popping because the sharp pain will get my attention, but i’ll remain conscious a couple of minutes, long enough to have a deathbed conversion and embrace Jesus as my personal savior, thus insuring an eternity in heaven in case it’s still there. To touch all bases, i’ll also explain to Allah and Vishnu that i was just kidding in that loose talk about atheism and actually think they’re wonderful entities entirely worthy of my worship and surely they won’t mind my side bet on Jesus. I had put way too much thought into trying to arrange to keep this website up for a little while after my sister has cancelled my credit cards, but then it finally sank in that since my readership has not soared out of the hundreds, the people have spoken and i’ll just let the site die when Sonic’s last bill bounces. So if you want to copy a recipe or something, you should go ahead and do it now. The odds are good that i’ll have another birthday, but they’re excellent that there’ll be few of ’em. Oh, and i’ll keep posting until i can no longer reach the keyboard. 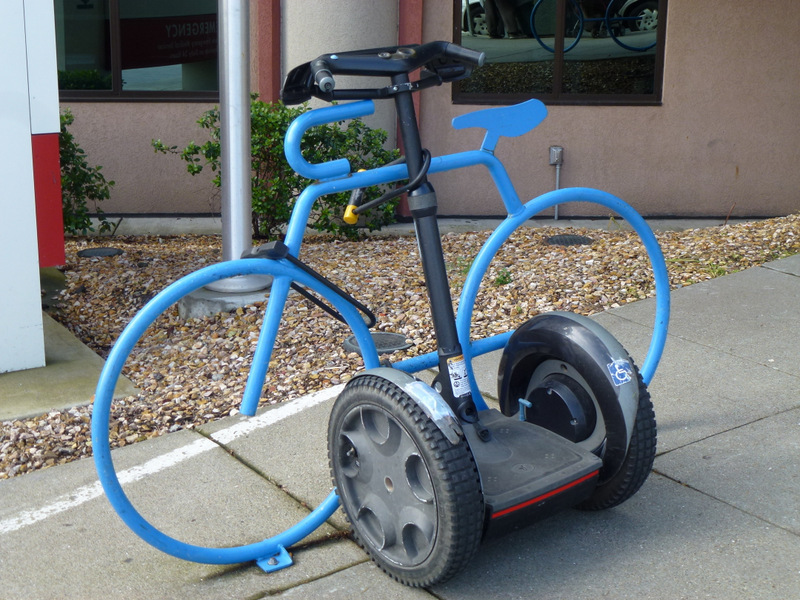 Meanwhile, when visiting my friend Nina in Kaiser, i affix the Segway to a handsome bike rack.